Review: 2014-12-20, fight not particularly good between Renan Barao and Mitch Gagnon: it gets two stars (UFC Performance of the Night). The black belt in Brazilian jiu-jitsu Renan ‘Barao’ Pegado entered this fight with a pro mma record of 32-2-0 (69% finishing rate) and he is ranked as the No.2 bantamweight in the world, he has fought twice in 2014 beating Urijah Faber in their rematch (=Barao vs Faber 2) but then he was defeated by TJ Dillashaw losing his Ufc Bw title (=Barao vs Dillashaw). His opponent, Mitch Gagnon, has a record of 12-2-0 (92% submission victory rate – he has never won via ko/tko) and he entered as the No.18 in the same weight class, he suffered his last defeat in 2012 when he faced Bryan Caraway (=Caraway vs Gagnon); since then he has won four consecutive bouts, the last one against Roman Salazar (=Gagnon vs Salazar). 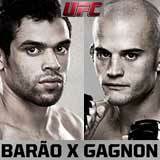 Barao vs Gagnon is on the undercard of Lyoto Machida vs CB Dollaway – UFC FN 58. Watch the video and rate this fight!